Show your pet some extra love by baking fresh snacks. By making dog treats yourself, you can control for allergens, save money, and ensure the quality of the ingredients you feed your dog. You can start with a basic biscuit recipe, and then explore ways to spice it up. Although this dog treat recipe performs best with meat broth, it is possible to substitute water. Just be aware that without the additional meat fats, the end result may be less enticing to your pet. The yield for this dog treat recipe depends on how large you cut the biscuits, but you should end up with about 45 average-sized dog treats. Combine the yeast and warm broth in a small bowl, and set aside to let the yeast activate. Combine the flours, cornmeal and milk in a separate bowl. Pour the yeast/liquid combo into the dry ingredients, and mix until the dough pulls away from the side of the bowl. Turn the dough out onto a lightly-floured cutting board, and roll or pat to about 1/4-inch thick. Slice the dough into rectangles, or cut with a cookie cutter, and bake on a non-stick cookie sheet for 40 to 45 minutes until well set. Turn off the heat, and leave the biscuits in the cooling oven for at least twelve hours to allow them to dry. 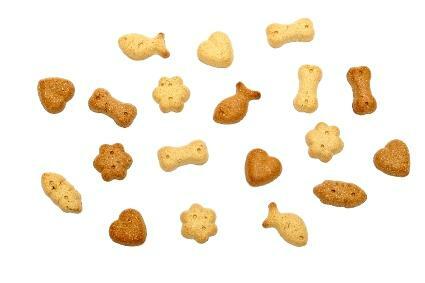 Give Fido a taste of peanut butter with these yummy dog treats that are sure to please. This recipe yields approximately 25 to 30 dog treats. Combine the oats, butter and boiling water in a large bowl. Allow the mixture to rest for approximately 20 minutes, until it becomes sticky in consistency. Add the cornmeal, flour, egg and peanut butter to the oatmeal mixture, and stir until flaky. Slowly add the milk to the peanut butter mixture, stirring well until a stiff dough forms. Scoop up the mixture by the tablespoon, and roll into balls. Arrange the balls on a baking sheet lined with parchment paper and bake for approximately 40 minutes, or until crisp. There's also no rule that says dog treats have to be shaped like bones. You can make your dog biscuits more festive by using your holiday cookie cutters to shape the dough, or you can twist two smaller pieces of rolled dough together for a treat with lots of texture. Keep your treats in a sealed or airtight container, and use them within a few weeks at most. If your treats are developing mold, that means there is too much moisture in them. It's important to bake the biscuits until they are dry to remove as much moisture as possible, then seal them in an airtight container, and put the larger portion of the batch into the freezer. Just keep a few out to use in the next couple days, and pull the rest out as needed. It's hard to keep track of the ever-changing list of ingredients that are used store-bought dog treats and other pet foods. One day a specific preservative is deemed safe, the next day it's found to have adverse health affects. Then there is the question of dyes and other unnecessary chemicals. The only way to be one-hundred percent confident in the quality and safety of your pet's edibles is to make them yourself. Once you've attempted a few homemade recipes for your pooch, you'll likely find that baking dog snacks is both fun and rewarding.